*Kate came in with severe pain in her lower back and her hip and after trying ice, anti-inflammatories and another chiropractor she made an appointment with Simple Truth Chiropractic. After a few short visits, Kate was pain free! . *Stephanie had suffered with chronic migraines for years before going to a chiropractor. After a month of chiropractic adjustments, Stephanie is finally pain free and able to enjoy her life and spend time with her kids without having to lay down because she was in so much pain. *Tom was in a severe car accident that left him in a lot of pain in his neck, mid back and lower back. After coming in for an evaluation and x-ray's, we determined the extent of his problem and were able to get him back to 100% in just 4 months using only specific chiropractic care. He didn't have to take any pain medications, muscle relaxers or need surgery. *Meet Aurora. She's a professional dancer that has suffered from injuries for many years. She had hip, knee, ankle, wrist and elbow problems that were preventing her from rehearsing and performing. She also had severe neck and back problems that were also holding her back from her performances. After a few short visits, we were able to achieve almost 100% relief from her injuries and she is now able to practice for hours without the severe pain she was getting before. We love taking care of athletes with chiropractic because it's all about keeping the body in alignment to prevent injuries and allow the body to perform at 100% capacity. *After years of pain and a complete lack of motion in her neck, Janet has finally been able to turn her head and has completely eliminated any need for Tylenol and ibuprofen (which she was taking by the handfuls.) The Simple Truth is that your body is designed to heal as long as you remove and reduce the interference from your nervous system. *Say hi to Nilda! She was suffering with severe,sharp lower back pain that was keeping her from working and sleeping. She also had headaches off and on and severe anxiety. She had tried steroid injections every three months and was on a lot of different pain medications and even an anti-anxiety medication. After two weeks of chiropractic care, she is feeling better than she has in years, is no longer taking pain medication and is sleeping better than when she was taking her sleeping pills! *This is Shonnie and she had been suffering with lower back, severe neck and hip pain for close to 5 years. She had tried many different solutions, but after a while she just gave up on ever living a normal life and doing all of the things that she liked to do. After someone recommended her to come to Simple Truth Chiropractic, the results became obvious after just a couple of visits. Just watch as she tells her story and notice how happy she gets when she talks about all the things she's able to do now after chiropractic care! *After trying several other medical specialists and chiropractors for his sciatica, Jim came to Simple Truth Chiropractic and finally got the relief he was searching for. It only took 4 visits for 100% resolution of his sciatica problem. *It was such a pleasure helping this woman get off of 4 parkinson's medications and getting rid of her migraines that she's suffered with for years. *After seeking care at St. Mary's spine center, we were able to help Kay get help with her sciatica pain that was shooting down her legs for years. She's now sleeping restfully through the night and has eliminated a majority of her pain medications. 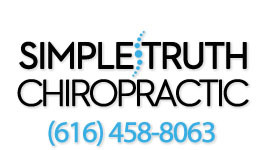 *Adam had awesome success with chiropractic at Simple Truth Chiropractic getting rid of his lower back pain that had been plaguing him and keeping him from working pain free. *"I would go no where else. I am out of pain after my treatment. Even my jaw, which bothered me for 35 years, feels great. No more pain after two treatments on that! The massage therapist is fabulous. I feel great whenever I go to her." - Alyssa M.
*"Chiropractic has made a great physical difference in my life. I no longer have pain in my right elbow that has been there for 6+ years. My posture has improved. I no longer slouch! Regular adjustments and massages have eliminated the tightness/discomfort in my upper back and neck that was caused by all my stress." - Toni R.
*"I feel like I can do more now and I have more energy. Before coming here my back and body hurt so much I didn't want to do anything." - Bill H.
*"I'm a former surgery patient where they fused my entire low back. My neck and shoulders are a whole different story now... no pain anymore. The problems with my heel are steadily improving and my knees are pain-free. I'm finally "getting there!" The massages have also been invaluable to me! Pain-free for 2-3 days at a time." - Karen S. from Grand Rapids, Michigan. *"Chiropractic care has eliminated my chronic headaches, which has been a huge positive in my quality of life. I also feel stronger and my posture feels a lot straighter. I've been living under a great deal of stress and chiropractic care has helped me handle it in a more positive way." - Linda Buckley from Caledonia, Michigan. *"I came in ages ago (almost 7+ years) with TMJ with problems in my mid back to the point I wouldn't move without severe pain. Today, I have no TMJ and I stopped seeing my TMJ doctor 2 years ago. I have very little pain anymore except for an occasional headache." - Sheryl Vanderwagen form Coopersville, Michigan. *"When I first came here, I could barely walk 10 feet across the room without getting a sharp pain in my hips and back. After one visit, I felt a lot better. After one week I went back to work and I've been improving ever since." - Michelle H. from Wyoming, Michigan. *"Improved my balance. I don't fall down anymore like I used to. I got immense relief fro my fibromyalgia. The symptoms have greatly improved, especially in conjunction with my dietary recommendations. The numbness and tingling as well as the migraines has been greatly reduced as well." - Pat H. from Wyoming, Michigan. *"The sharp pain in my upper back and shoulders has greatly decreased. I started coming here for that reason. Being a police officer and wearing a 25 lb. belt and a vest, sitting in a car for long period of time can put a lot of strain on the back. I believe I have avoided many serious problems because I come in on a regular basis." - Eric Kazelskis from Grand Rapids, Michigan. *"It consistently minimizes my pain, keeps me from spiraling into a worse condition and helps me stay healthy and balanced. I would say it has even undone some of the effects of again.I would tell people that chiropractic is an irreplaceable part of a healthy life. Those who won't use chiropractic for whatever reason are much worse off for it." - Jim White from Grand Rapids, Michigan. *"Since I have received chiropractic care, I have had a lot more energy throughout the day. This has helped me to be a more productive and better teacher for my students. I have also noticed a change in my mood as well. I am happier and not as irritable. I am also able to sleep a lot better at night." - Alecia Fohlbrook from Twin Lake, Michigan. *"I've had better movement, and a lot less pain. I am more active without the accompanying pain or stiffness. I'm much more productive at work as well." - Bob Macmillan from Grand Rapids, Michigan. "I was at the point where I had trouble walking and was trying a new running regiment. Well, when you can't walk wlel it's difficult to run. After a few visits to the office I was able to pick back up my running and just completed my first 10K last weekend! And surgery was NOT required. :) I'm so pleased that it works. I've even had my 2 year old adjusted!" - Liz Tracy of Grand Rapids, Michigan. We love to hear how we're doing with our practice members! If you have a story you'd share about how we've improved your health and wellness, let us know at the front desk so we can do a video with you or click on one of the three links below to leave us a review. *Disclaimer: Results may vary. Some conditions are not treatable by chiropractors.